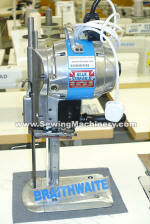 Eastman Bluestreak Straight Knife cloth cutting machine. Serviced & pat tested with 30days warranty. 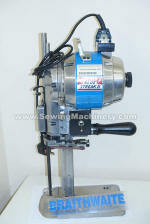 Used Eastman 629R Bluestreak II 8" blade cloth cutting machine. Eastman 629R 8" blade cloth cutting machine. Special slow speed model to reduce heat & fusing. 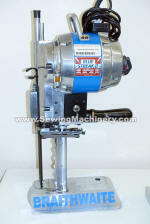 6" heavy duty Straight Knife cloth cutting machine. 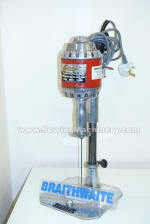 Eastman Brute 627 with powerful heavy duty black motor. 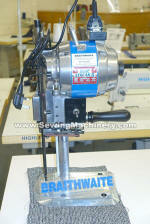 8" heavy duty Straight Knife cloth cutting machine. Eastman Brute class 627 with larger and more powerful heavy duty motor. 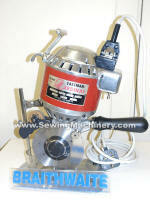 Eastman 627X heavy duty Straight Knife cloth cutting machine. Larger and more powerful heavy duty Brute motor. 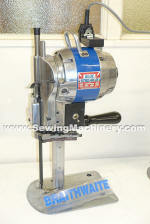 10" heavy duty Straight Knife cloth cutting machine. 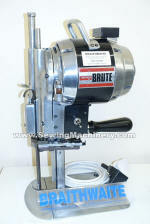 Eastman Brute 627X with powerful heavy duty 1100W motor. Eastman Straight Knife Blue Streak II with 11.5" long blade. Serviced and supplied with accessories + 90days RTB warranty. Eastman's super-duty cardinal is its most powerful round knife model with a 1.25 horsepower motor. Hot & cold model Counter lever device and large square base plate.